Clip builder allows users to quickly edit video clips and more efficiently manage incident reporting. Users can organize video clips for investigations fasters. With clip builder, users have a single, complete, convenient location to store and view all relevant clips for each investigation. Watch a video on how to configure the clip builder. Simultaneously records all streaming video in your selected layout into a single clip file. Easily create a clip Click the red button to begin and select the red button to end. Once the recording has been ended, it can be saved, saved to an incident or exported. The clip will play back exactly as it was in the surveillance window. Watch a video on how to configure this feature. The new schedule clip download tool enables operators to schedule the automatic retrieval of reoccurring video clips they need to review daily, saving on bandwidth usage and operator time spent manually queuing videos for download. Queuing regular video footage downloads such as locking a cash drawer up at the close of business, automates routine processes and increases operator productivity. Schedule clip download allows users to customize the length of the clip, saving location and clip expiration. Users can create their own custom video layouts tailored to their own needs. By navigating to system values and video layout preferences, you can define your new layout. 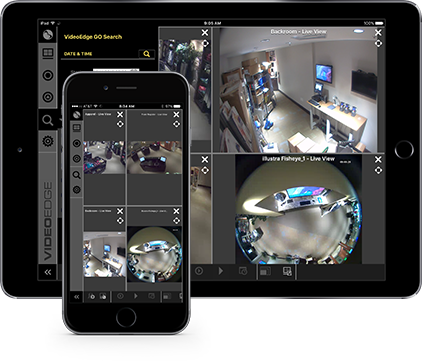 Users will also be able to specify minimum and maximum camera recording rates and receive notifications in the event log on their specified levels through the VideoEdge NVR and VideoEdge Hybrid NVR Client or through victor. The new storage management feature ensures improved health monitoring and optimal storage capacity. 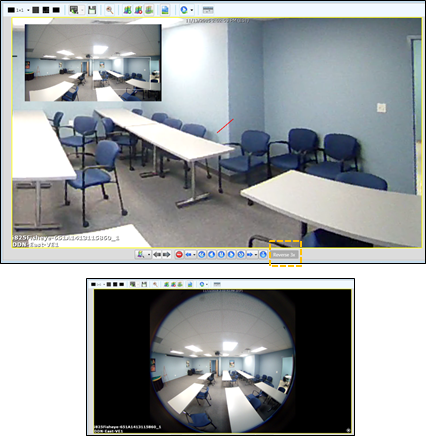 victor offers enhanced camera management capabilities, including 360 fisheye camera client-side dewarping for exacqVision NVRs in live and recorded mode. 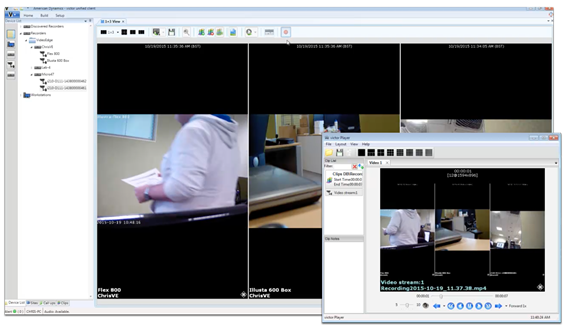 Client-side dewarping records one video stream and eliminates the possibility of redundant recording, allowing users to zoom in and navigate within the image for greater detail. Whether it’s the casino operator who needs high resolution video from more than 100 cameras or the security director who needs access to a live event from his/her iPhone and requires a real-time high quality image stream from multiple cameras, American Dynamics advanced stream management brings video transcoding to the next level. 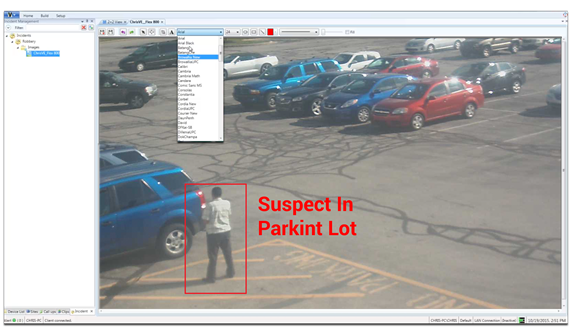 While IP video and mobile devices offer greater surveillance capabilities, these come at a price. Increased CPU bandwidth associated with today’s high resolution and full featured cameras adds overhead costs and network resource constraints. During critical situations, users may need to access video remotely from a device that is readily available, oftentimes a smartphone or a tablet. However, when transmitting video from IP cameras to these devices, latency can occur, which delays the time between the alarm and the transmission of a usable image. VideoEdge and victor streams are managed to provide users with video tailored to fit their physical viewing conditions. 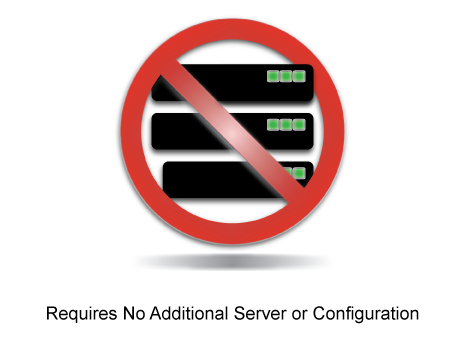 By managing the stream, network bandwidth is greatly reduced with no visible difference to the user, and CPU resources are conserved while using less client memory than possible before. VideoEdge users can achieve greater efficiency and higher definition image quality while using their existing cameras through transcoding — a video stream method that reduces the scale of video, converting it to one best suited for the available network connection, such as MPEG-4 to H.264. While transcoding is not a new tool, what is different is that the optimal results now are even easier to realize with an NVR and a video management system, without the need for an extra server, new workstations or expensive super computers to run the video management system (VMS) software. The automatic stream management in VideoEdge requires no additional configuration. VMS systems can automatically determine the optimal image quality required to view video from multiple, different resolution megapixel cameras on a 1080-pixel monitor. And when end users need to access multiple views during an active security event in progress like a building alarm going off or a hostage situation unfolding, the VMS can enable access to up to four live video feeds on a smartphone — up to six on a tablet — in a format that is sufficient for viewing on mobile devices without overcompensating. Just by leveraging the components already required for a video surveillance setup, end users can get the video quality they want in the format that works best for their requirements, when and where needed. For example, users can respond to alarms and other events on the system without being hindered by a slow client. 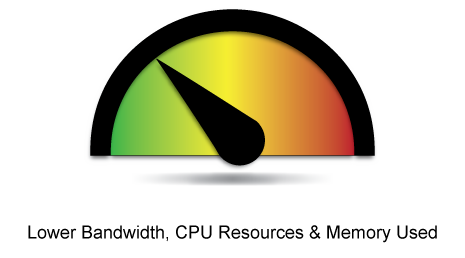 The overall user experience with American Dynamics stream management improves usability for live and recorded video. And that’s important these days because video systems are diverse. Users are combining multi-megapixel cameras with different bandwidth needs and viewing all of them on a single monitor. Together, transcoding and the other aspects of optimal stream management help to balance systems, allowing the most challenging situations regarding image quality and delivery to be handled seamlessly from within the VideoEdge system. This ensures that users only have to be concerned with addressing an event as it unfolds before them. Download our Resource Management whitepaper to learn more about stream management technology and transcoding.